Thermodynamics and kinetics (i.e., chemical interactions) are extremely important concepts for pharmaceutical scientists to understand since the “drug selection process”, that is, the process used by pharmaceutical companies to discover and develop marketable drugs, is totally dependent upon these theories. While both theories are important, kinetic models describing complex chemical and biological processes provide a unifying theory for all phases of the discovery and development of drugs. Unfortunately, in most textbooks the mathematical descriptions necessary to develop a deeper understanding of kinetic models are omitted. This is primarily done such that the underlying chemistry and biochemistry principles are not obscured by the “mathematical maze” that is generated from these models. As a result many chemists and biologists veer rapidly away from thermodynamics and kinetics. For some scientists, this can lead to confusion on how to apply these models to real-life situations. For example, many enzyme kinetic models are formulated as rate equations. Since experimentally measurements typically determine concentrations and rarely determines rates directly, confusion arises on how to apply kinetic models. In this case, either the model is integrated to give a description of the concentration course of the enzyme reaction or the data is differentiated (i.e., the process of determining rates) by measuring tangents to the reaction curves at zero time. The level of mathematical skills required to solve kinetic models is minimal for anyone who has studied college level algebra and calculus. Thus, the objective of this book is to present a brief review of thermodynamics and kinetics followed by a detailed step-by-step approach in developing and solving kinetic models for complex chemical and biological processes. The book focuses on building a solid mathematical foundation of enzyme kinetic models by systematically evolving simple uni- and bi-molecular models to enzyme models. 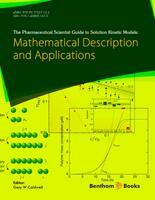 Applications for some of these kinetic models are generated from pharmaceutical examples and a selection of problems is presented at the end of each chapter. This elementary approach has been intentionally selected to keep the book at a self-explanatory level. It is anticipated that the reader will be able to follow the mathematical operations and in the process develop a deeper understanding of kinetic models and an improved ability to interpret kinetic parameters. The book is restricted to solution chemical kinetics and does not deal with the theories of chemical reactions, gas-phase reactions, experimental kinetic methods and so on. There are many excellent chemical kinetic textbooks available for those interested in these topics. The solution chemical kinetics materials for the book were obtained from literature papers and several books on physical chemistry and enzyme kinetics. The ideas from these sources have been hopefully reinterpreted in a style that is well matched to those pharmaceutical scientists that do not have a comprehensive knowledge of kinetic models and the mathematical skills to solve them. Chapter 1 presents a general overview to thermodynamic and kinetic principals and theory. In Section i, an overview to the scope of the book is presented. A brief review of mathematical fundamentals used in the book (Section ii) and kinetic and thermodynamic principals are present (Section iii and iv). A glossary of symbols and abbreviation used throughout the book is presented in Section v. Chapter 2 describes the basic theory of first-order kinetic models. These types of mathematical models are used for irreversible (Section I) and reversible (Section II) rearrangement reactions and some examples are presented to illustrate their applications to drug discovery. Chapter 3 describes second-order irreversible (Section III) and reversible (Section IV) dimerization reactions while Chapter 4 describes second-order irreversible (Section V) and reversible (Section VI) binding reactions. Chapter 5 describes partially and fully coupled reversible completive binding reactions (Section VII). Chapter 6 describes second-order kinetic models that are used to analyze consecutive irreversible (Section VIII) and reversible (Section IX) substrate suicide enzyme reactions. Chapter 7 describes kinetic models that are used to analyze consecutive irreversible (Section X) and reversible (Sections XI and XII) enzyme reactions. Chapter 8 describes kinetic models that are used to analyze consecutive reversible inhibition enzyme reactions (Section XIII - XVI). Chapter 9 describes kinetic models that are used to analyze substrate (Section XVII) and product inhibition (Section XVIII) enzyme reactions. The Appendix contains the answers to the problems. Johnson & Johnson, Pharmaceutical Research & Development, L.L.C.